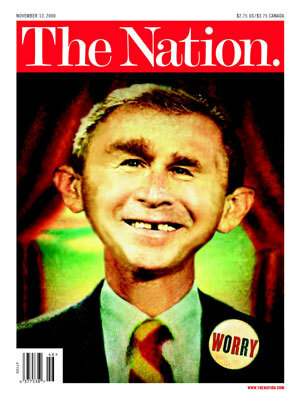 What we know so far ...: Bush: "What, Me Worry?" -- A “GOP insider who informally counsels the West Wing,” quoted by U.S. News & World Report on the Bush administration's “over confidence” about the midterm elections. It is tempting to say that the Party of Bush has no exit strategy from power or that this is just so typical of the inability of these buffoons to deal with an inconvenient truth. How is this different in kind from King George’s reaction to the report in Lancet that there have been over 600,000 Iraqi deaths as a result of the American invasion and occupation – a number 20 times the official U.S. estimate? This was a scientific, peer-reviewed epidemiological study published in one of the world's most prestigious medical journals. The authors followed the same methodology that has been used to provide unchallenged estimates of deaths in other conflicts, such as the Congo. No question, it's violent, but this report is one -- they put it out before, it was pretty well -- the methodology was pretty well discredited. But I talk to people like General Casey and, of course, the Iraqi government put out a statement talking about the report. Of course, King George has a vested interest in remaining ignorant of the extent of the death and destruction he has visited upon Iraq. But how will he profit from keeping his head in the sand vis-à-vis the end of Republican hegemony in Congress? Assume there is a 20% chance of the Democratic party taking over both houses of Congress, and a 40% chance of them obtaining a majority in one house. Even Bush would have to deal with this possibility, since the possible consequences include impeachment. You might think that Bush is sublimely confident because he has an October surprise that will swing the election. The problem with this theory is that anything that he might do just highlights people’s distrust of him. Invade Iran? I wouldn’t count on that to make people rally ‘round the flag-pole. It is true that Bush has always benefited from bad news, 9-11 being the most conspicuous example. But it has worn thin. F’rinstance: did Dubya get a bump from North Korea exploding a bomb? I don’t think so. Even if the plan for the Bushies is to have an October surprise, they had better have a plan B. And that is what scares me. The way I see it, there’s only one reason why the Bush White House is not deeply concerned that they might lose the election. And that reason is … the fix is in. Answer truthfully, if not out loud. Do you trust that the votes will be counted after the midterm elections? Are you willing to rely on Diebolt machines that leave no paper trail? My fear is that King George is, and that is why he’s not worried. Do you think Dubya or any of his cronies would SHOW they are worried? Of course not! Political strategy has always been to display utter confidence at all times, no matter how worried you are about impending defeat.